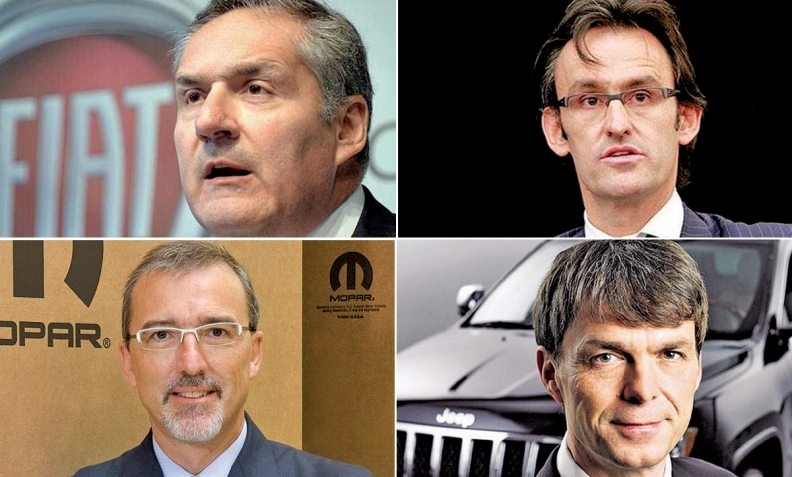 Clockwise, top from left: Altavilla: Europe, Africa, Middle East chief; Palmer: High-profile role as Fiat CFO; Manley: Jeep boss for nearly a decade; Gorlier: Distribution and dealerships expert. As Fiat Chrysler Automobiles CEO Sergio Marchionne prepares to retire, just who will succeed him — and who will select that person — remains unclear. Marchionne confidently told reporters last month in Detroit that his successor would be a male member of the automaker's Group Executive Council, FCA's top management decision-making body. He said the fact that neither of the two women on the council was under consideration was an "inherited" failure of the company's human resources. Marchionne said his successor would be announced after a June 1 presentation in Italy of the company's 2018-22 business plan. John Elkann, scion of the Agnelli family and chairman of Exor, the holding company that owns a controlling stake in FCA, is likely to have the final say on FCA's next CEO. Alfredo Altavilla: The head of FCA's Europe, Africa and Middle East region and an executive with Fiat since 1990, Altavilla, 54, is a top trusted hand who has guided FCA's home region in Europe through years of crisis and back to profitability. An Italian, Altavilla also is charged with leading oversight of business development. Altavilla likely would be viewed as a low-risk choice to follow Marchionne. Richard Palmer: Fiat's CFO for 11 years, the 51-year-old Palmer has a high-profile role and is well-liked among the investment community. Cautious and whip-smart, Palmer has overseen paydown of FCA's net debt (which is expected to turn to a net cash position by June 1) while helping the automaker hit aggressive financial targets set as much as five years earlier. In 2016, he added the role of COO for FCA's Systems and Castings operations, giving him added operational management experience. Palmer lives and works in London, FCA's tax domicile. As CEO, he likely would continue to focus on FCA's financial performance and be far less hands-on with product development than Marchionne. Michael Manley: A native Brit like Palmer, Manley has been running FCA's most important brand, Jeep, since Fiat gained control of Chrysler in June 2009. Unlike the other front-runners, Manley, 53, got his executive experience while climbing the ranks of DaimlerChrysler, which he joined in 2000. In addition to shepherding the domestic and international growth of Jeep since 2009, Manley ran FCA's Asia Pacific region, overseeing development of joint ventures with FCA's Chinese partner, Guangzhou Automobile Group, and expansion of FCA's manufacturing footprint into India until early 2017. Manley could serve an extended term as FCA's CEO and would be unlikely to deviate far from the course laid out by Marchionne. Pietro Gorlier: Like Altavilla, Gorlier is an Italian whose full career has been spent in the Fiat empire. He started in 1989 as a market analyst for Iveco, which makes commercial vehicles. Gorlier, 55, is the automaker's go-to expert on its distribution network and dealerships. As head of Mopar, Gorlier since 2009 has ridden herd over the integration of Fiat and Chrysler's worldwide parts and service network, one of the most profitable pieces of FCA's portfolio. He also heads FCA's components division, including subsidiary Magneti Marelli, which the FCA board is considering spinning off this month. Gorlier may be less well-known outside the company or to investors, but he'd be viewed as a solid choice to succeed Marchionne.